December 16, 2013 by Ken Ward Jr. Tougher Chinese policies aimed at reducing dependency on coal will help restrain global coal demand growth over the next five years, the International Energy Agency (IEA) says in its annual Medium-Term Coal Market Report released today. Despite the slightly slower pace of growth, however, coal will meet more of the increase in global primary energy than oil or gas – continuing a trend that has been in place for more than a decade. Like it or not, coal is here to stay for a long time to come. Coal is abundant and geopolitically secure, and coal-fired plants are easily integrated into existing power systems. With advantages like these, it is easy to see why coal demand continues to grow. But it is equally important to emphasise that coal in its current form is simply unsustainable. There is no denying the controversial reality of coal, and its dominance of power generation worldwide. No fuel draws the same ire, particularly for its polluting qualities both locally and in terms of greenhouse gas emissions. And yet no fuel is as responsible for powering the economic growth that has pulled billions out of poverty in the past decades. As we look to the long term, we must ask what role coal has to play in the energy mix that we want to achieve – because there will be a role. But without mitigating the polluting effects of coal, pursuing business as usual will have enormous and tragic consequences. Coal‐fired heat and power generation is the biggest single source of carbon dioxide emissions resulting from fuel combustion today. More than three‐fifths of the rise in global CO2 emissions since 2000 is due to the burning of coal to produce electricity and heat. And we should not overlook the health problems tied to local pollution produced by coal combustion. There are solutions to both the issues of local pollution and CO2 emissions. Underground coal gasification is a form of clean coal technology that mainly addresses the former. Some major countries have recently announced policies to encourage the construction and use of highly efficient coal power plants … and to promote carbon capture and storage (CCS). We welcome those efforts as part of the broader push to reduce the environmental impact of coal. Yet if nothing more than those emissions‐reduction policy commitments and pledges announced to date are implemented, we project that the long‐term increase in global temperatures will reach 4 degrees Celsius. This would exceed the globally agreed target of limiting the long‐term rise in temperatures to 2°C and would lead to a devastating and costly change in climate, the first signs of which we are already seeing today. Radical action is needed to curb greenhouse gas emissions, yet that radical action is disappointingly absent. Progress on CCS is effectively stalled, and a meaningful carbon price is missing. West Virginia is desperate for our political leadership to work for all citizens and create new economies in this post-coal reality. Our politicians openly refuse to even meet with WV citizens who are labeled anti-coal. The War on Coal labels of “pro-coal” and “anti-coal” have served to divide the people of this state. Now, more than ever, we must work together to help solve our urgent economic and social problems. Despite all our wealth, the people here are left without basic resources while the shareholders of these out of state coal companies reap the benefits . WV coal miners have paid a hefty price so rich industrialists can put their names on schools and libraries in NYC leaving us to scrape together funding to build schools in WV like Marsh Fork Elementary. It is a sad legacy. 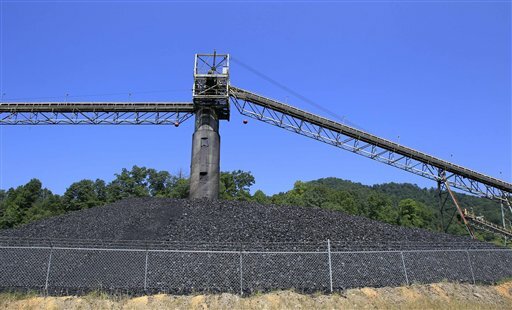 What new economies will raise West Virginians out of this “post coal economy”? Why haven’t West Virginians in the past bought coal company stock that has been available for years on the open market? There by having more say in what goes on. I’m not sure what “post coal reality” is given that the IEA has always projected coal as a significant source of energy in the United States. Nothing about that has changed despite what any “pro-coal” or “anti-coal” individual’s state. For those who say it cannot continue in its current form, I would submit that those individuals are not familiar with the hundreds of millions of dollars Appalachian Power and others are spending at coal fired power plants to reduce emissions. From scrubbers on stacks, new mercury ponds, continued R & D on carbon sequestration and like projects, energy companies are doing everything they can to clean up emissions. The one thing I personally find ironic in this conversation is that those opposed to coal as an energy source will use the Marcellus shale as a reason to end coal but when the conversation turns to fracking, those same people are as opposed to that practice as they are coal. That’s all well and good and I couldn’t agree more but the problem is companies like Appalachian power cannot get permits needed to build these plants. In the early 2000’s, AEP/Appalachian Power designed two integrated gasification combined cycle plants along the Ohio River. A new plant, the Great Bend Power plant was going to be constructed at Meigs, OH and the Mountaineer Power Plant in New Haven, WV was going to expand to meet current and future energy needs. Combined, the two plants would have increased MW production in a more efficient manner while shutting down 5 current power plants. Upon applying for air and other permits, both projects were attacked by environmental groups, held up in litigation and eventually “defeated” as the Sierra Club brags on their web page. Carbon sequestration has been taken out of the equation and is no longer under consideration for federal R and D money. Those dollars have since been diverted to green energy projects which would be acceptable save for the fact that green energy does not have the capability to replace coal as a viable energy source. The bottom line is, if we are going to meet future energy demands, coal will be part of the equation. Aaron is absolutely correct. Could not have said it better myself. I also notice that the anti-coal groups equate coal mining with coal for power plants and never address the need for metallurgical grade coal for steel. There will always be a need for coal for steel, chemicals, and power. As an engineer who deals with building industrial facilities, I know full well how the environmental movement has hampered industrial growth through the permitting process; however, as a WV native who grew up in the coal fields of Wyoming county I also know full well how cavalier and contemptuous the coal companies were with environmental compliance. For every action there is an equal and opposite re-action and this is what is really holding back WV. Both sides of the issue have refused any thought toward compromise chosing instead to wrap themselves in their own dogma. A pox on both their houses! The issue was the rejection of rate requests for the construction of the plants. And the issue with that is the utility commissions aren’t going to approve the rates if the utilities aren’t required to install CCS by EPA or otherwise. Most experts agree that the only way to have both coal and a liveable climate is CCS … and they also agree that the only way CCS is going to happen if it is required by the government. My information came from the page you linked Ken, a fact I referenced with the comment regarding the Sierra club’s bragging about killing the project. I realize why the permits were denied but the simple fact is, had both plants been approved, then the 2 plants combined would have replaced aging plants and provided more energy to consumers while reducing carbon emissions. I do note that while you tried to discredit my comments regarding the 2 IGCC power plants, you failed to mention the R and D money initially approved for CCS for FutureGen as part of the Obama Stimulus package has never come to fruition but the President and his energy department have had no problem in wasting trillions of taxpayer dollars on green energy projects with companies like Solyndra, Fisker, Telsa and Ener1. It seems to me that if the government truly wanted to aid in CCS technology, they would speak with taxpayer dollars instead of empty promises. After all, unlike the green energy projects that have consumed so many taxpayer dollars with little to no results, coal is a proven source of energy with the capabilities of meeting our energy needs.